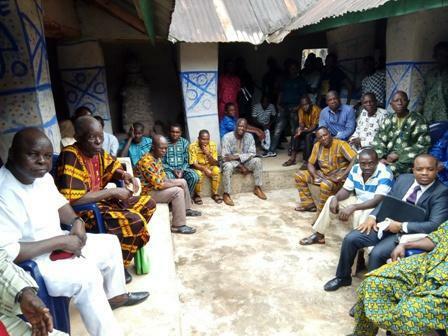 At the meeting which took place at the Obi’s palace in Abavo, it was unanimously resolved that ten-man committee should be inaugurated to further strengthen the relationship between the oil producing company and the Abavo (host) community. The community subsequently gave the Pan-Ocean company two weeks ultimatum to resume work in the community and to also make sure their G.M.O.U is signed. The community further charged the oil company to always plan and discuss issues that concern oil and gas exploration in the community with the committee members who were selected from the seven quarters in the kingdom and that when the issues go beyond them, they should come to the king for more information and clarification. Speaking further, the community advised the committee to maintain peace with the oil company, adding that it is only peace, unity and cooperation that can bring positive result to the kingdom. They charged Mr. Ketiku to always feel free to come to them when he has important issues to discuss and to above all, carry everybody, particularly the youths along. The Community Relations Manager, Mr. Patrick Ketiku assured the Obi and the entire people of Abavo kingdom that in no distant time, they will start shipping the crude oil in the area, disclosing that it is when they start shipping crude oil from the oil well that Abavo kingdom can be called an oil producing community in Nigeria. He emphasized that by then, things will become more meaningful and beneficial to the youths and development of Nigerian economy. He added that the issue of shipping has been of top priority of Governor Ifeanyi Okowa, as he has been making effort to see it come true. He also noted that through the unrelenting efforts of the governor, the commissioning of the shipping of the oil will be done soon. He then thanked the governor for tarring the Ekuku-Ndemili road to Umutu community which he said has been their major challenge during rainy seasons.